We are fortunate that the life and work of James Gresham was chronicled by his grandson Colin A. Gresham in a small but essential book James Gresham and the Vacuum Railway Brake published in 1983. Colin Alastair Gresham (1913-1989) was the son of James Gresham's youngest son, Frank James Gresham. He lived in Criccieth, North Wales, and wrote extensively on the history and archaeology of the Criccieth area; he was awarded an honorary doctorate by the University of Wales in 1969. In compiling this page, we have relied heavily on Colin Gresham's book, which contains much on his engineering inventions and some notes about his art collection, as well as family history and some anecdotes and family legends. We read that, when a teenager, he persuaded the local cemetery to commission a picture of their premises, and included a small dog for artistic effect. The clients then refused to pay on the grounds that dogs were not allowed in the cemetery. On a trip to India in 1892 with the second Mrs G. to inspect their works there, he was, the tale runs, approached by the captain of the ship who had heard he was an artist. Another passenger, a prince of Siam, was to disembark at Bombay, and the ship was required to fly the flag of Siam, a complicated affair with a white elephant on a red background, which was not available on board. James and Helen made one up with material from a red ensign and a white tablecloth, and protocol was satisfied. However, having been written, perhaps partly from memory, at the age of 70, the book does suffer from some errors. The dates of James's home in Old Trafford do not agree with Census records, and Gallery House is said to be in Ashton-under-Lyne, a town some miles away from Ashton-upon-Mersey. Colin Gresham's papers, including the manuscript of the book, were donated in 1990 to the National Library of Wales. 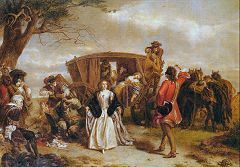 From Colin Gresham's notes, the article in Manchester Faces and Places, and some internet searching, we can make a brief survey of James Gresham's art collection, including works he presented to galleries. Many of the items at Gallery House were replicas commissioned from the original artist, or preparatory studies. Artists are listed even when no titles of works are known: if you can add any information about works once owned by Gresham, please write. Sold by Sotheby's in the New York in May 2005 for $192,000, having been owned from 1994 by fashion designer Gianni Versace, who was murdered in 1997. Cox, David: Twelve pictures including Mill near Lichfield, Lancaster Sands, and The Salmon Trap. which retained its popularity well into the 1800s. 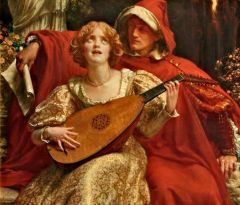 * Goetze, Sigismund Christian Hubert: "Thy Voice is like to Music heard ere Birth/Some Spirit-Lute touched on a Spirit Sea"
Lady Lever Art Gallery, Port Sunlight. 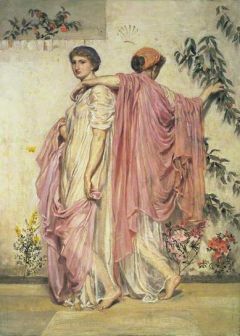 Purchased from the artist for the gallery at the 1917 auction. 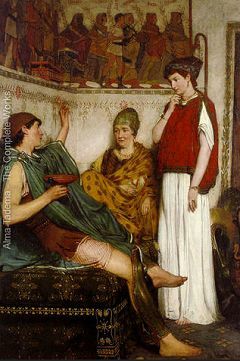 Illustration of a scene from the long poem Marpessa by Stephen Philips, published in 1897. Now the property of the London Borough of Hammersmith and Fulham, London as part of the Cecil French bequest. Their catalogue gives an interesting full provenance, probably typical of the history of works sold after Gresham's death. Notice how the sale price decreased as Victorian art went out of fashion: Cecil French (1879-1953), an artist himself, was able to build up a fine collection at low cost. The Sotheby's sale record for this work in 2006 tells a fascinating story, not just of this painting, but also of Gresham and his collection. 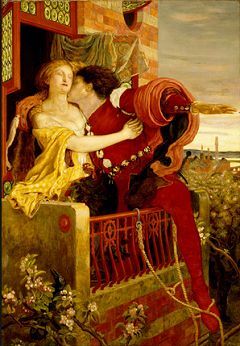 Attributed to Millais for many years, the work was bought following the 1917 auction by Lord Leverhulme, and remained in his family until sold in 2001. Knott Mill, in Manchester, was the site of a twice-weekly market. The tall iron column indicates the market square, once a Roman camp, A primary feature of the market was the second-hand clothes stalls, run by Irish women. Art Treasures in Manchester: 150 years on by Tristram Hunt and Victoria Whitefield. Manchester Art Gallery, 2007. The book of the 2007 exhibition. James Gresham and the Vacuum Railway Brake by Colin A. Gresham. Published by Cyhoeddiadau Mei, Penygroes, North Wales, in 1983. 'Mr James Gresham, M.Inst.C.E., M. Inst. M.E., etc.' Manchester Faces and Places, Vol.9 (1898) p. 108-114. W. Burnett Tracy, and W.T Pike, Manchester and Salford at the Close of the 19th Century: Contemporary Biographies. Brighton: W.T. Pike & Co., 1899. Biography of James Gresham, p.190. James Gresham, engineer and art collector, counts with Enriqueta Rylands as one of John Cassidy's greatest patrons. He purchased, and donated to the City of Manchester, two of Cassidy's most significant bronze statues, King Edward VII and 'Adrift.' On this page we try to track down Gresham the man, his life and times, and some of his achievements. 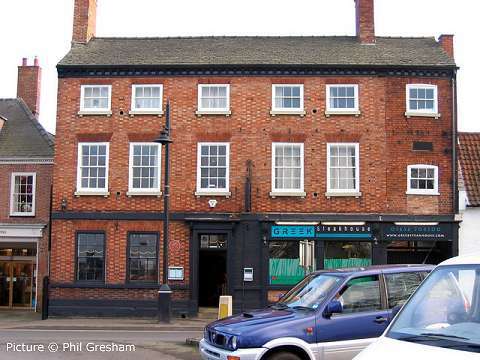 James Gresham was born on 28 December 1836 in the house pictured above, 13 Castle Gate, Newark, Nottinghamshire, to Richard and Elizabeth Gresham. He had an elder brother Robert and an elder sister Elizabeth. Richard Gresham was a seed merchant: he died while James was a baby, and his widow Elizabeth later re-married to become Elizabeth Reynolds. James was educated at the Grammar School in Newark. At the age of fifteen he broke his leg in an accident. It was decided to send him by coach to Lincoln, 16 miles away, for the attention of a bone-setter; unfortunately the coach overturned, and he broke his collar-bone as well as doing further damage to his leg. He was returned to Newark, where a doctor amputated his leg above the knee - most likely without anaesthetic. He was supplied with a primitive wooden leg, which he proceeded to improve upon by inventing an artificial leg which would allowing him to walk almost normally. Showing early business acumen, he sold the design to a maker of surgical appliances. While restricted in mobility, he took to drawing and painting, and 1855 he headed to London, using the remaining proceeds from the artificial leg to enrol at the South Kensington School of Art. There he met and befriended William P. Frith, today one of the best-known of Victorian artists, for his large works such as 'The Railway Station.' 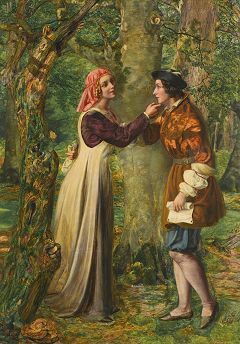 While at South Kensington Gresham came to realise, with advice from Frith and other tutors, that although he was a naturally skilled draughtsman, and excelled at copying the works of other artists - Daniel Maclise was a particular favourite - he lacked the artistic inspiration to create an original painting. Gresham's role in Manchester was to help organise the exhibits, and make drawings and pictures of this remarkable event which took place in a specially-built glass-and-iron building palace, covering three acres of the Botanical Gardens in Old Trafford just outside Manchester. Paintings and works of art of all kinds were brought on loan to the exhibition from all points of the compass, often by rail to a station created alongside the grounds for the purpose. The exhibition was open from May to October 1857, and attracted over 1,300,000 visitors. The exhibition over, and all the treasures returned to their owners, Gresham was in need of another job. He found one at the Atlas Works of Sharp Stewart and Company in Manchester city centre, makers of textile machinery and railway locomotives, where he trained as an engineering draughtsman. There, he first turned his hand to improvements in steam locomotive accessories: in particular, the injector, which is a basically-simple device to deliver water into a locomotive boiler under steam pressure without the complexities of a mechanical pump. He also worked on improvements to the company's textile machinery, and designed an improved machine for winding sewing thread on to bobbins. In 1861, he married Louisa Jane Horseley, a native of Gunthorpe Lodge, Lowdham, in his home county of Nottinghamshire, who is described by his grandson Colin as 'a very strict Victorian wife, who kept her husband and children under firm discipline.' She would have been supported, in the early years of the marriage, by Martha Battle, apparently his wife's grandmother, whom the 1861 census records as living with James and Louisa in their little house at 49 Rutland Street, Chorlton-on-Medlock, not far from the Atlas Works. For some reason, he exaggerated his age to the census-taker, describing himself as 35. 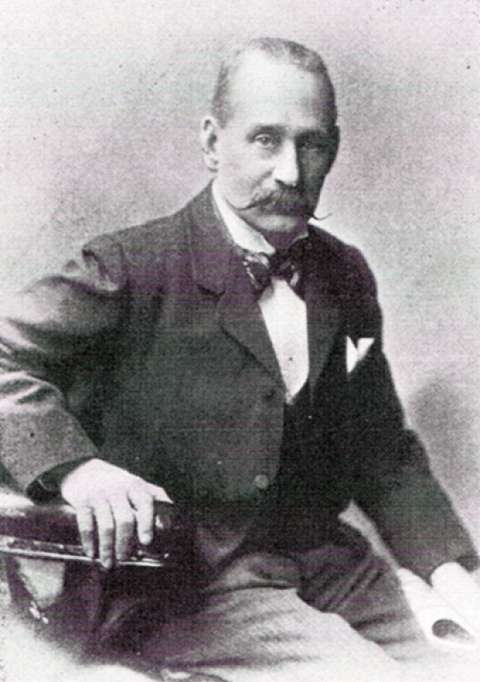 In 1865, after an argument with Sharp Stewart over his salary, he left the company and headed off with his wife and two children (Adah and Harry) to London where he worked for a while at the Whitechapel Iron Works, but a few months later he was back in Manchester, where he worked as a self-employed engineering consultant, advising firms and inventing various gadgets including an egg-boiling pan with built-in timer, whilst working on plans to create a practical sewing-machine, an idea he picked up while in London from a man named Ivor Dimmock. The two of them patented a machine in 1869. By the time of 1871 Census, Gresham was living at 16 Wilton Street, Chorlton-on-Medlock, with his wife Louisa Jane and their children Adah (aged 9), Harry (6), Samuel (3) and Frank (11 months) and describing himself as 'Master Engineer, employing 28 men and 15 boys.' He gave his age more accurately this time, as 35. Now very much of the middle-class, they had a live-in 'domestic servant', Mary Collinson. 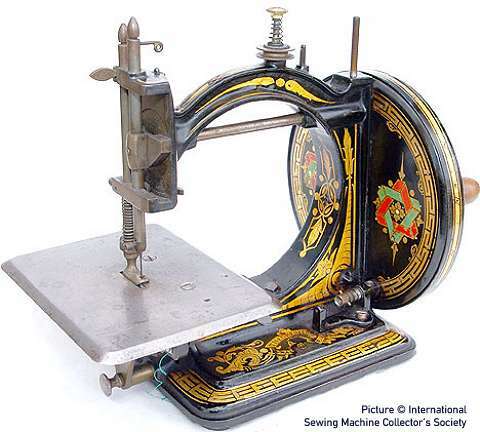 Gresham & Craven's injectors were very popular, but they had less success with their sewing machines, eventually leaving the field, after circa 1884, to mass-production makers such as Singer who could bring the sewing machine to the masses. The next development in their range was to be braking equipment for trains, at a time when Government and the public were demanding greater safety on the rails than could be offered by hand-operated brakes. Mr Heron left the firm due to illness, and the firm took on the name 'Gresham & Craven' under which it became known worldwide. From 1878 they were manufacturing and selling an effective vacuum-powered braking system, which went on, in improved form, to become the standard for most railways in Britain and across the British Empire, against fierce competition from the air-braking system of the Westinghouse company. In 1879 The Vacuum Brake Company was set up in London to market the product, involving Gresham & Craven as well as other brake manufacturers, and this arrangement continued for man years, as the letterhead from 1940 shows. The vacuum brake as applied to steam locomotives creates its vacuum using a device called at 'ejector' which uses steam to pump air out of the system using a principle closely-allied to that of the injector. Gresham & Craven also developed, in conjunction with the Midland Railway company, a device which use steam to force sand on to the rails under the wheels of locomotives, preventing slipping, which also proved a good seller. It was to be the 1960s before British Railways began universal adoption of the more powerful, but more complex, air-brake concept, but not before Gresham & Craven equipment had been used in most of the diesel multiple-unit trains built under the 'modernisation plan' of the 1950s. The Ordsall Lane works appears to have closed around 1962, after the completion of the diesel multiple-unit contract. The company continued trading from premises in Walkden and later in Cheadle, near Stockport. Eventually, the firm was merged into the empire of their one-time rival, the Westinghouse Brake and Signal Company, but happily, at the start of the new century part of their factory in Salford has been restored as office accommodation, with the name 'Gresham & Craven Ltd' in large lettering visible to travellers on the Metrolink trams, between G-Mex and Cornbrook stations on the north side of the line, and a nearby development of apartments is named 'Gresham Mill.' The Westinghouse brake business, after several take-overs, is now part of German company Knorr-Bremse. 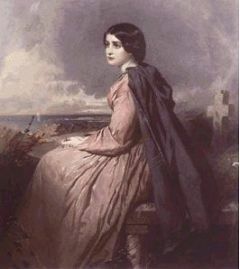 Louisa Jane Gresham died in 1876; she is, we believe, buried in Brooklands Cemetery. By the 1881 census the family was comfortably established at Oak Bank, 656 Chester Road, Old Trafford, with James's daughter Adah, his son Harry (now a draughtsman with the firm) and Samuel, and his mother Elizabeth Reynolds, now widowed for the second time, attended by a housemaid and a cook. James was not present that day: perhaps he was in London. In 1887, this domestic bliss was somewhat disrupted by James's surprise announcement that at the age of 50 he had married, in London, Helen Amelia Myers, an 'attractive mature woman ... very different from his first wife.' Not only that, they had a baby daughter, named Millicent. A second household developed at Radnor House, 1 Bolton Gardens, South Kensington, London: the 1901 census records James, Helen, Millicent and four servants. (His friend William Frith notoriously had two households in the same area of London.) Millicent later married Walter Jones of Anglesey. The new Mrs Gresham was not keen to live 'up north' - but some time around 1905 James moved his first family into a bigger house, 'Ashleigh', in Woodheys Park, later known as The Avenue, in Ashton-upon-Mersey, then in countryside outside Manchester (see our page on The Avenue). The house was built for a banker, George Oliver, on land bought in 1871 from William Brooks, a local banker and landowner, and latterly had been the home of Thomas Craven, Gresham's partner. Helen Gresham does eventually appear to have joined her husband there after all the children had left. She is recorded at Gallery House in the 1911 census. Gresham re-named the house from 'Ashleigh' (or Ash Lea) to 'Oak Bank' after his earlier home, and later to 'Gallery House' after he added a private art gallery, designed by architect William Higginbottom of Manchester, who created a number of significant buildings in the Edwardian period, several of which are now listed as of historic interest, including 49, 51-53 and 59-61 Piccadilly as well as Canada House, a large steel-framed warehouse in Chepstow Street, built in 1909. In his new mansion, Gresham indulged his lifelong passion for art: for years he had been collecting paintings, taking care to patronise living artists, especially his friend W.P. 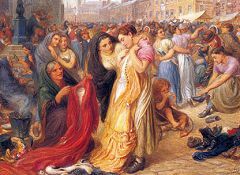 Frith, from whom he bought nearly 50 works, including in 1894 a commissioned replica of the famous large work 'Derby Day' which is now in Manchester Art Gallery. (See the left-hand column for more about his collection.) In 1887, he served on the committee organising the Royal Jubilee Exhibition, which took place on the same ground in Old Trafford as the 1857 one which first drew him to Manchester. John Cassidy took part in this exhibition with his demonstration of modelling in clay, and it could well have been here that he met James Gresham, who went on to fund, to the tune of several thousand pounds, the two public sculptures. 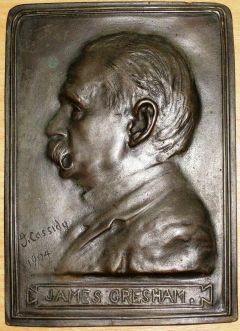 Cassidy created a bronze bust of Gresham, which was shown at the 1904 Royal Academy Exhibition: the present location of this work remains to be discovered. The second Mrs Gresham was also portrayed by Cassidy: the 1911 exhibition of the Manchester Academy of Fine Arts featured that lady twice, as a marble bust and a miniature medallion. Millicent Gresham was also the subject of a small medallion, now in the Manchester Arts Gallery collection. Gresham's philanthropy also included a contribution to the building of a new School of Science and Art in his home town of Newark, opened in 1900. Mr. James Gresham, who has been for many years a kind friend to Henshaw's Blind Asylum, has just presented to the Board of Management his late residence, 'Oak Bank', and land sufficient for the erection of commodious and up-to-date workshops. The gift is rendered more valuable on account of its close proximity to the Parent Institution, and the very considerable amount of building materials included. The Board of Management are deeply grateful to their generous benefactor. The house, which was one of several in the area taken over by the Asylum, became the 'Millie Gresham Home for Blind Men', opened in 1914 and named after Gresham's daughter by his second marriage, Millicent. Thomas Henshaw was an Oldham hat-maker left £20,000 to found the charity, which is still active in 2015 under the name of 'The Henshaw's Society for Blind People.' The main building of the Asylum, opened in 1837, and later joined by an equivalent 'Deaf and Dumb' establishment, was an elaborate gothic-style edifice in Old Trafford next door to the Botanical Gardens, site of the 1887 Royal Jubilee Exhibition and an area which Gresham knew well. The map extract above dated 1922 shows 'Oak Bank' which we have marked in orange, the Botanical Gardens gateway (still extant) in green, and the main buildings of the Blind Asylum on the right. 'Oak Bank' was closed in 1930, in favour of a seaside home in Rhyl. By the 1950s it had been replaced by a large garage building, which still stands in 2015 as part of the extensive Evans Halshaw car dealership. The main Asylum building survived until the 1970s, before being pulled down and replaced by Chester House, an 11-storey block in the modernist style opened in 1979, which housed the headquarters of the Greater Manchester Police. This building had a remarkably short life; the Police moved out in 2010, and considered 'beyond economic repair' it was demolished in 2013. Plans for the site in 2015 envisage it as a car park for supporters attending matches at the nearby football ground. James Gresham died on 13 January 1914, and according to his wishes, was cremated; the ashes were deposited at Manchester Crematorium. His estate was valued at £461,593 (equivalent to over £300 million in present-day values), and his will specified bequests to several local hospitals, as well as the Blind Asylum and Deaf and Dumb school in Old Trafford. His children inherited his shares in Gresham & Craven, where all the sons worked. Gallery House and the paintings passed to his widow Helen - in the case of the house, this was on condition that she promised to live there at least 180 days per year. She declined to do this, and everything had to be sold. She received an annuity, and bought a house in Richmond where she lived until her death in 1918. 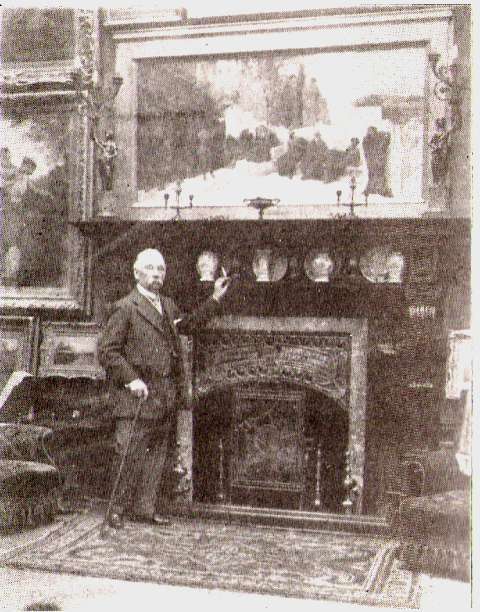 His will stated that on his wife's death, or should she no longer wish to live at Gallery House, his trustees might, at their discretion, select such paintings from his collection, except those painted by himself, as they considered suitable, and 'hand them to the Art Gallery Committee of the Manchester Corporation'. A small number of works were so transferred, how they were chosen is not clear. Included was a bronze bust of W.P. 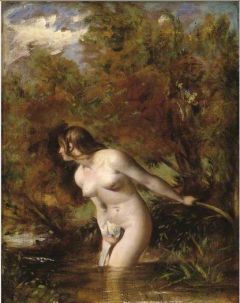 Frith by John Cassidy. Gallery House,with its extensive grounds,was left unwanted: nobody needed such a mansion in the post-war world with its shortage of servants, especially one with an art gallery attached. Its fate is a little obscure, but it appears from available information that the land was sold to a builder called Mr Dean, who had the house demolished and built for himself a large bungalow, reviving the old name of Ashleigh, and building houses for sale on some of the remaining land. The straight footpath on the eastern boundary became a street called 'Denesway' (after Mr Dean?) and the curving drive to the house from The Avenue is now a wooded cul-de-sac named 'Moorwood Drive'. We have found no pictures of the exterior of Gallery House: if you can help, please get in touch. Of the other three houses known to have been home to the Greshams: Rutland Street and Wilton Street both were virtually obliterated by developments in the 1960s, although Wilton Street has recently re-appeared in a rather different form as a walkway on the University campus. And yet - memories of James Gresham remain in 'The Avenue' in 2009: the servants' cottages in the grounds are still there, as 7 to 13 Moorwood drive, and No 7 still bears the name 'Gallery Cottage.' An old outbuilding also survives, in poor condition, and the gateposts at the start of the cobbled drive still stand as a memorial to Gresham and his private art gallery. 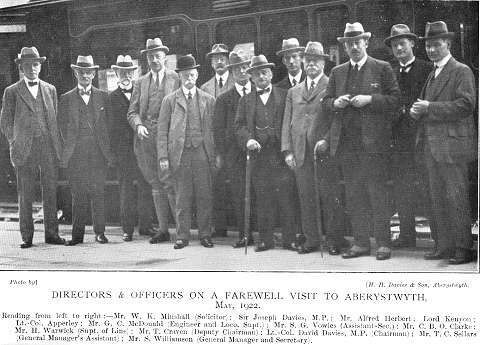 As for Thomas Craven, Gresham's partner, little appears to have been written about him; he is known to have outlived Gresham, as in his capacity as Deputy Chairman of the Cambrian Railways company he appears (fourth from right, with stick) in the above photograph, taken at the time the Cambrian sold out to the Great Western Railway in 1922. Colin Gresham seems to imply that he was simply an investor, but he certainly was an engineer in his own right, as well as a Justice of the Peace and a Deputy Lieutenant of the County. The factory in Salford was known as the 'Craven Iron Works' suggesting that Craven established it before the Gresham & Craven firm was founded. 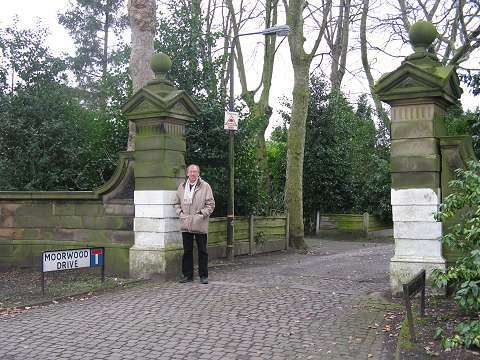 A last view: the author at James Gresham's gateway in 2009. If you can add anything to this story, please contact us. Written by Charlie Hulme, March 2009. Last updated August 2015.